Farewell!, originally uploaded by Aubs. I had hoped to have just oodles of time to write a long, thought-out post on this news, but alas, “oodles of time” is a pipe dream. Five minutes is more like reality. 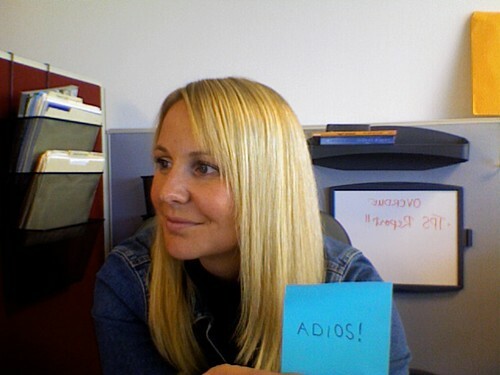 Anyway, today is my last day here at Ask. “Didn’t you just start?”, you’re probably asking. Yep, back in May. But alas, opportunities – awesome, super-great, exciting opportunities arose – and I couldn’t refuse. On Monday, I’ll be starting as the Director of Marketing at Mashery, a company that provides for “On-Demand API Infrastructure” (Read: Helps you deploy, manage, & scale your APIs) and I honestly can’t wait. Big things lie ahead. I’m sure I’ll be posting about this more in the coming days & weeks, but in the meantime, wanted to offer a sincere thanks and a bittersweet goodbye to Ask and the opportunity I’ve had here. Thanks, everyone, and Adios! And we’re thrilled to have you, Aubrey – nice big pile of stuff for you to start on as soon as you arrive.